← Sliced Ham with Red-Eye Gravy; Cook book give-away! I was introduced to Rock Cornish Game Hens when I was at university. guys every Sunday in exchange for dinner and drinks. Naturally, we had to do the cooking. Neither of us actually had much experience cooking, but what we lacked in actual skill and knowledge, we made up for with enthusiasm and creativity. Most of what we made was edible…. sometimes helped along by copious amounts of beer and wine. Games Hens…. Missing a wing or a leg. foods Mom had sent down that week. After I grew up, got a place of my own and started entertaining, Cornish Hens became my signature dish. They were easy to make – just pop them in the oven. They were impressive to serve – each diner getting their own, perfectly (I hoped) roasted little bird. They were cheaper than the other popular dinner party item of the time: steak. No one else did them. I had found a niche. We can't get them here. We can get little chickens or coquelet. They are about the same size as a Cornish Hen, 16oz (500gr) each…. Wash hens and pat dry with paper towels. Mix 1 tbs oil with lemon juice and 1 tsp each of the herbs. Divide herb mixture and put half into each of the hens. Tie legs close and bend wings around and under the back – so it looks like they are lying there with their arms akimbo. It keeps them from flapping and gives the hen something to rest on. Lay them on a rack in a shallow baking pan. Mix the remaining oil, herbs, mustard and red wine and brush on hens. Put into 400F (200C). 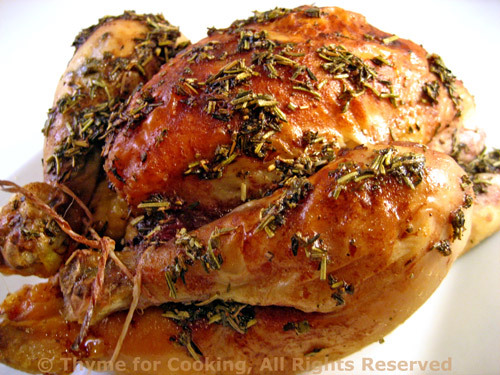 Bake for 50 – 60 minutes, basting every 15 minutes with wine mixture, until done. I recommend a meat thermometer. 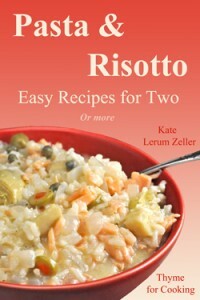 For those who don't know – I'm giving away a cook book…..
See the prior post for details on how to enter the contest. Nice recipe, Katie. I can almost smell the herbs from here. I love Cornish Game Hens. Like you, I used to roast them all the time, years ago. They were so inexpensive back then. I remember buy them for 99-cents. Each! Now they cost almost as much as, sometimes more than, a free-range whole grown up chicken. At one-fourth the size. Go figure. That bird looks spectacular….nice and herby and golden-brown. Poussin…love how that sounds. I bet the whole kitchen smelled like heaven while roasting it!!! Mmmmmm, delicious Katie! Now that I have a brand new coccote I think I could try your recipe in there and see what happens, do you recomend so? What do you think about the timing? That arrangement you had seems like a pretty good deal. It must have been fun to experiment with someone else’s ingredients every week! Like a mini dinner party. These little hens sound so good! I’ve never had one before but I like the sound of that red wine sauce. I love game hens. They’re a favorite dinner party go-to for me too because my husband won’t eat red meat and these look impressive enough for my guests to not have to think about how I’m serving them chicken yet again. Great recipe. I have new inspiration for my next dinner party. Your days in college sound so fun and full of creative activities! I lived in France (my family lived in the Seine et Marne area for 15 years) so I am familiar with the “poussin”; what a cute name too! Love your recipe, smells so good with all these herbs! Christine, here they are sill cheaper than a big bird – and a lot more tender… so we do them often. Great on the grill. Peter, and all that crisp skin…. Nuria, I saw your cocotte! They would be delicious… not as brown, though, I don’t think but very juicy! Joanne, it was a great deal – and so much better than cafeterian food! Val I do remember Tater Tots…. (Forgive me) Let’s say my tastes were eclectic. Tasteofbeirut, thanks – yes, we did have fun… and the house smelled wonderful! I love the herbs you’ve used here. Classic and delicious. We are getting close to the time of year when I can buy fresh herbs at the local market. I can’t wait to try this! Kristi, we’re getting close to being able to plant some. I rarely see them in the markets, probably because everyone grows there own – living in farm country and all ;-)) Hope you like it! Oh my god absolutely lovely.. My stomach is rumbling..
We just made this for Thanksgiving and they were soooo good. Thanks for sharing the recipe we will definitely use it again.